During October, M2Moms® Sponsor WWE and Susan G. Komen teamed up for their third annual breast cancer awareness campaign called Courage Conquer Cure, which included WWE Superstars and Divas wearing co-branded apparel and WWE platforms “going pink”. Throughout the month, the WWE announcer table, entrance ramp and ring skirts were co-branded and the middle ring rope turned pink to promote the fight against breast cancer. In addition, WWE utilized all of its assets including WWE Network, TV and pay-per-view telecasts, live events, and digital and social media to drive awareness for Komen’s mission. Monday Night Raw was hosted by The Today Show’s Kathie Lee and Hoda, Hoda herself a seven year breast cancer survivor. Hulk Hogan went pink with his “Hulkamania” t-shirt, recognizing his “Komen Maniacs” in the crowd, and bringing survivors in the ring to join him in a classic pose-down. But perhaps the most compelling content was an appearance by Joan Lunden, who is currently battling breast cancer. “The next time I come back, I want to be one of those survivors sitting in the front row,” Ms. Lunden said, and then went on to name each survivor in attendance. The entire audience rose to their feet to give them all a standing ovation. In addition, WWE Superstars, Divas and Legends helped spread awareness through numerous national and local media interviews including The Today Show, Variety, Sports Illustrated and WGN. All of these efforts generated more than 650 million impressions combined on WWE TV broadcasts and social and digital media. The awareness has also helped raise more than $1.5 million for Komen to date. There are more than 3 million breast cancer survivors in the U.S. today and it is our hope that WWE’s continued partnership with Susan G. Komen will turn more breast cancer patients into breast cancer survivors. 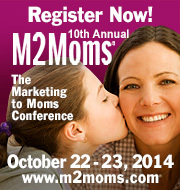 In October 2014, WWE sponsored the 10th Annual M2Moms® – The Marketing to Moms Conference in Chicago. Chief Branding Officer Stephanie McMahon presented with Komen’s Carrie Glasscock and Kraft Foods’ Gregg Horvat, Brand Manager for Capri Sun, on how WWE engages with Moms.